Chicago’s St. Patrick’s Day parade dates back to 1858, Hundreds of thousands of spectators lined up to see the floats, dancers, and marching bands close to Lake Michigan. For a complete history of the parade, click here. Saturday, March 11, 2017 from 12 pm to 1:30 pm. 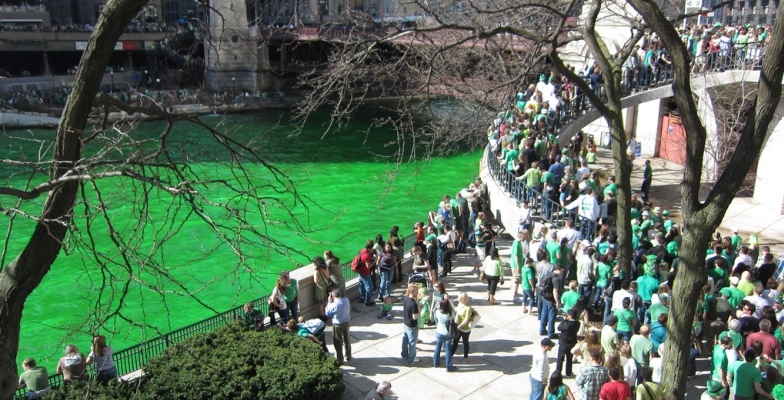 St. Paddy's Day festivities start with the dyeing of the Chicago River at 9am on Saturday, March 11, 2017.. The Parade always occurs on a Saturday. If St. Patrick's Day does not fall on a Saturday, the Parade is held the Saturday before. Scheduled for 9:00 am, Saturday March 11, 2017 the dyeing can be best viewed from the East side of Michigan Avenue, the West side of Columbus Drive, or upper and lower Wacker Drive between Michigan Avenue and Columbus Drive. Public Transportation Highly Recommended! We strongly recommend that you come downtown early and if possible take public transportation. The following are directions to the parade using various public transport methodsg deck on Juniper, the Proscenium parking deck on Crescent and the Promenade II parking deck on 15th will be open for a fee, typically $10 to $20.